In category theory, all information about objects is encoded in the arrows (morphisms) between them. You’re not supposed to look inside an object to study its internal structure. You’re supposed to look at the relationships this object has with other objects in the category, including itself. This takes some getting used to, especially when you’re talking about familiar objects like sets. How do you express the idea that a set is empty, or that it consists of pairs of elements from two other sets, without talking about elements? On the other hand, if you learn to construct particular types of sets purely in terms of their relationships, you can easily apply those constructions to other categories. So let’s try to define a product of two sets A and B by looking only at its relationships with other objects — relationships being morphisms or, in the case of sets, functions. A Cartesian product AxB comes equipped with two functions called projections (in Haskell they are called fst and snd). So maybe a product AxB can be defined as a set equipped with two functions — one mapping it into A and the other mapping it into B. Unfortunately, there are infinitely many such sets, most of them looking nothing like a product, so it’s not a very good definition. It turns out that, in order to characterize a set as being a product of A and B, we have to look at its relationship with every other set that has maps into A and B. Only when our set is surrounded by other similar sets, does it stand out. It stands out as the model for its relationship with A and B. It’s the one that has “the best” projections. Its projections are so good that any other pair of projections from any other set have to factor through them. Let me explain what that means. Factorization of q1 and q2 through h.
If this were multiplication of natural numbers, we would say that q1 and q2 have a common factor, h. Here, q1 and q2 are functions and the dot is composition, but we still say that q1 and q2 factorize through h.
In most cases there will be no such function h, and we won’t be able to compare candidates. And that’s okay. But sometimes we’ll get really lucky, and there will be one and only one such function h between Y and X. In that case we will say that X is better than Y as the candidate for the product of A and B.
where y is an element of Y. Of course, we are not allowed to look at the components, but I wanted to motivate our preference for Y over X. Some sets will be too small, others will be too big — like Goldilocks, we have to find the one that’s just right. 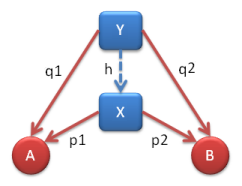 What’s important is that we have a way of comparing triples (X, p1, p2) based on unique factorizability. If there exist “the best” such triple — one that any other triple uniquely factorizes into — we’ll call it the product of A and B. Again, it’s not necessary that any two triples be comparable — we don’t need the total order. We just need any triple to be comparable with the one that represents the product. Notice that I used a very general language of objects and morphisms, rather than sets and functions. This lets us define products in an arbitrary category. There is no guarantee that a product of two arbitrary objects exists in a particular category. And even if it exists, it doesn’t have to be unique. Well, it has to be unique up to an isomorphism. The intuition is this: If you have two objects X and Y that both fulfill our conditions, then there must be a mapping h from X to Y, and a mapping h’ from Y to X, both factorizing the respective projections. One can easily show that they have to be the inverse of each other. Even in Haskell, the Cartesian product of two types is not unique. The built-in pair is one representation, but here’s another one:. You might wonder what this universal definition of a product means in other, more exotic categories. Here’s one: Every partially ordered set (poset) is a category with the less-than-or-equal relations playing the role of morphisms. A product of two objects A and B in a poset turns out to be the largest object that’s smaller than both A and B, a.k.a., the meet, or the infimum, or the greatest lower bound. Here’s another: In the category of logical predicates, the product is the conjunction; and so on. This kind of characterization of a particular type of object in terms of its relationship with the rest of the universe is called a universal construction and is very common in category theory. We specify a certain property and then establish a hierarchy of objects according to how well they model this property. We then pick the “best” model. Best could mean the simplest, the least constrained, the smallest, or the largest, depending on the context. I used the same method in my previous blog, Understanding Free Monoids. There, the free monoid was picked as a universal object in the category of monoids. We considered all monoids that shared the same generators, and there was one (up to isomorphism) that could be uniquely mapped to all others. There’s much more to universal constructions that those few examples suggest. For instance, the statement that “there is a unique something for every something else” suggests some kind of isomorphism. Commuting diagrams hint at naturality — that is a natural transformations between functors. These ideas generalize to limits, co-limits, adjunctions and, ultimately, Kan extensions. I hope to write more on these topics in the future. Let’s try to use a universal construction to define an empty set without talking about elements (or, rather, lack thereof). What can we say about functions in and out of an empty set? First of all, you can’t have a function going from any non-empty set into an empty set. Just try defining a function from integers to an empty set: What’s its value at zero?! On the other hand, it’s easy to map an empty set to any other set. It’s a no-brainer: You’ll never be asked to provide any value. So an empty set has this property that there’s a unique mapping from it into any other set. Before we use it as a definition of emptiness, let’s ask if there is any other set with this property? There isn’t, because if there were, there would be a mapping from it to our empty set and we have just said that that was impossible. You might recognize initial algebras from my blog Understanding F-Algebras as examples of initial objects in the category of F-algebras. Every construction in category theory has its dual: one obtained by inverting the direction of all arrows. We have just defined the initial object as the one with unique morphisms going to any other object. The dual of that would be an object that has a unique morphism coming from any other object. We’ll call such an object, predictably, the terminal object. What’s the terminal object in the category of sets? It’s a one-element set. The unique morphism (function) from any set to a one-element set simply maps all elements of the set to that one element. It’s called the constant function. So here we have a universal definition of a one-element set as the final object in the category of sets. You say that in the category of logical predicates, the product is the conjuction. Can you elaborate? I don’t quite see how this is so. If a and b is true then a is true. Also, if a and b is true then b is true. These are the two projections. If you have another predicate c, and you can show that if c is true then a is true, and you can show that if c is true that b is true, then it follows that if c is true that a and b is true. That’s universality. Aah – so the morphism is “implies”. In other words, if c “implies” a and also c “implies” b, then c “implies” a and b. This is what the product captures. Did I get this right? I am going through Lawvere’s Conceptual Mathematics and came across your blog posts when I looked for more material on Exponentiation. That is when I realized you have these other posts – to say they are useful is a massive understatement. They are incredibly well-written. Thank you.